Deep within the heart of the Titiwangsa Mountain Range is Taman Negara, the country's first national park and home to some of the oldest rainforests in the world. Taman Negara, Malaysia's premier national park, is a natural paradise and home to hundreds of species of flora and fauna. The park covers as much as four thousand square kilometres of rainforests and is estimated to be more than 130 million years old. The park, which was originally known as King George V National Park, was expanded in 1939 to encompass three states, Pahang, Terengganu and Kelantan. Its present name, Taman Negara, was adopted only after Malaysia gained its independence in 1957. 14 years after Malaysia's independence, the park found itself in a predicament when the Malaysian National Electricity Board planned to build a dam on Sungai Tembeling in 1971. Although the proposal was scrapped in 1978, it was revived again 4 years later. Through conservation oriented efforts by Malaysian Nature Society, the idea was finally discarded a year later. If the proposal had gone through, the dam would have caused a reduction of 32,600 hectares of land from the park. 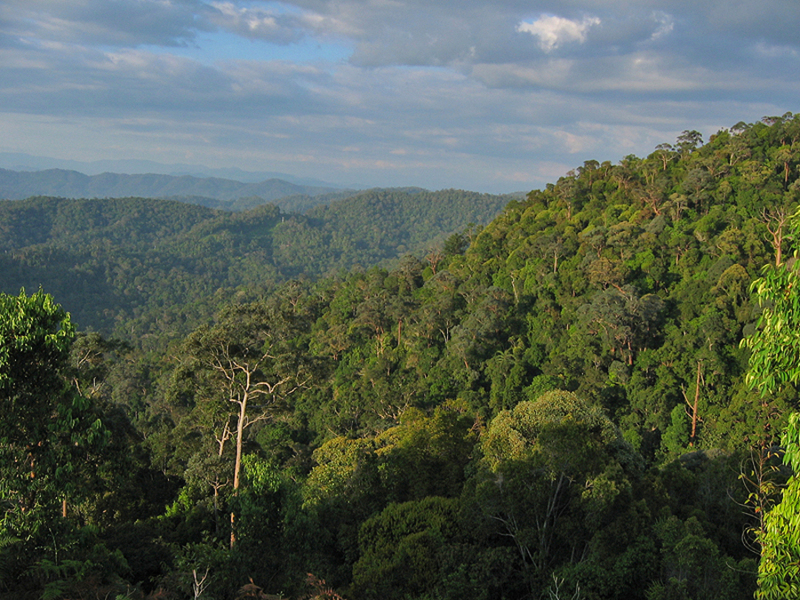 A staggering 185,000 species of fauna and 8,000 species of flowering plants have been recorded in Taman Negara. The tallest trees in South East Asia, the tualang tree, can also be found at the park. The forest's surrounding landscape is geologically stable, which has allowed uninterrupted evolution of the plants and wildlife through time. You can catch a glimpse of how people still live within this natural cycle when you visit Kampung Yong, an Orang Asli settlement in the park. Unhindered by modernization brought by time, the Orang Asli, as the indigenous tribes are known in Malaysia, continue on with their way of life as how their ancestors did in early civilization. The Canopy Walkway is one of the most visited attractions in Taman Negara. The walkway was built by the Malaysian Wildlife and National Parks Department and is among the world's longest canopy walks, measuring at an amazing 530 metres! Though the walkway was built for research purposes, it now serves as a means for visitors who would like to see the rainforest from a different perspective. No nails were used in the construction of the walkway and wooden spacers are placed between the bark and the cable and ropes to ensure that the trees are not harmed. Caving is one of the many adventures that await the park's visitors. Home to many species of bats, snakes and insects, limestone caves such as Gua Telinga in Taman Negara offer visitors hours of exploration. As with any caves whose permanent residents are bats, expect to find a huge amount of bat droppings, otherwise known as guano. Guano is essential to the ecosystem of caves as it supplies needed nutrients to most of the cave dwelling inhabitants. Another activity for the adventurous is rapid shooting. This fun filled activity never fails to elicit laughter as most participants end up soaked to the skin at the end of it. The experienced boatman skillfully weaves the boat through shallow rapids as the boat heads upstream pass picturesque greenery. When a boat encounters its counterparts going in the opposite direction, an oar is placed into the stream in such a way that it creates a spray of water which soaks the other boat's passengers. Since two can play at that game, it is best to be on guard when other boats are spotted! The main entrance to Taman Negara is located in Kuala Tahan, Pahang. A short boatride across Tembeling River from the the village is required for visitors who want to visit the national park. The drive to Kuala Tahan from Kuala Lumpur will take approximately 3 and a half hours. For those who are staying within Taman Negara, there is a common parking lot located at Kuala Tahan. Certain coaches operated by local travel agencies do offer transfer services directly to Kuala Tembeling jetty for a 2 and a half hour boat ride to Taman Negara. Alternatively, there are also express buses to Jerantut, Pahang on a daily basis. Buses headed to Taman Negara leave Jerantut town daily at designated times and stop at Kuala Tahan bus station. The journey from Jerantut to Kuala Tahan takes approximately an hour and a half. Taman Negara is also accessible by boat from the jetty at Kuala Tembeling. Coaches to Kuala Tembeling are operated by local travel agencies as mentioned above. Upon arrival at Kuala Tembeling jetty, proceed to the Malaysian Wildlife and National Parks Department counter to purchase the tickets for the boat ride to the park. The journey by river takes approximately two and a half hours without any stops along the way. The park authorities charge a minimal fee for camping at Lata Berkoh. The only other accommodation available in Taman Negara is a privately run hotel.